“Empathy is not something that can be taught or forced on to a person. It is something that comes from the heart, and you delivered it to me.” Those were the words from my guest of my second trial tour, Mr. Liam (Billy) Fitzpatrick, who further on wrote in my ‘tour diary’ stating that I was a ‘super-guide! !’, before we parted ways. I know that, I will keep those words with me for the rest of my life, in everything that I do because those words were the acknowledgement of the way I handle my work and the recognition of the fact that I am actually doing something right.I found this second trial tour so nerve-racking because my guests were extremely knowledgeable on the field of history, as mentioned by my group member who had the pleasure to be their guide in the previous tour; and that they were interested in places that I had not been trained in. Only up until this stage could I confess that I was threadily closed to telling my buddy that I could not do the tour because I was so afraid that my vague accumulation of information was hardly enough to make the tour enjoyable for the guests. Fortunately, I somehow gathered up enough courage to pull through and therefore to meet my amazing guests.We eventually decided to go to Vietnamese Military History Museum. In the place, I tried to squeeze out any and all details that my brain could remember from the history lessons in high school. Despite not getting into detailed dates, I managed to give out the legends, the stories and some strategies demonstrated from the pictures and things in the exhibition. Throughout the tour, I realized that I learnt so much more than what I had anticipated. I learnt that my history lessons were not rusty or gone to waste at all, they are all with me, pieces by pieces, all it takes for the information to come out is a teaspoon of pantophobia within me, a cup of non-stop thriving and an abundance of constant support and willingness of an audience in listening to me. I learnt more about Ireland, about the country’s history, the Irish language, the notable people in the revolution, the on-going process of attaining their freedom, ergo, learning the similarities between Vietnam and Ireland. Last but definitely not least, I learnt that at times, it’s not just about the place, nor about the numbers, facts and figures and what not; rather, sometimes, it’s just about the love and enthusiasm, from the guides, and from the guests. That’s what matters, because us people were those who made history, kept the history alive, and lived the history again for our descendants and fellow friends across the globe. There are so many people that I’m thankful for: my buddy, being the most supportive and incredibly knowledgeable person that there is for me, guiding me through the new information and also ways to communicate with the guests; my sub leader, who helped me by outlining what she talked about when she took her guests to the Military History Museum; my group members, who were extremely adorable and caring, always there to cheer me up and give me precious pieces of advice; and my mom, who is probably the most amazing woman ever in my life, for always rooting for me and my decisions and the one who actually drove me, my buddy and my guests from the Museum to their hotel. 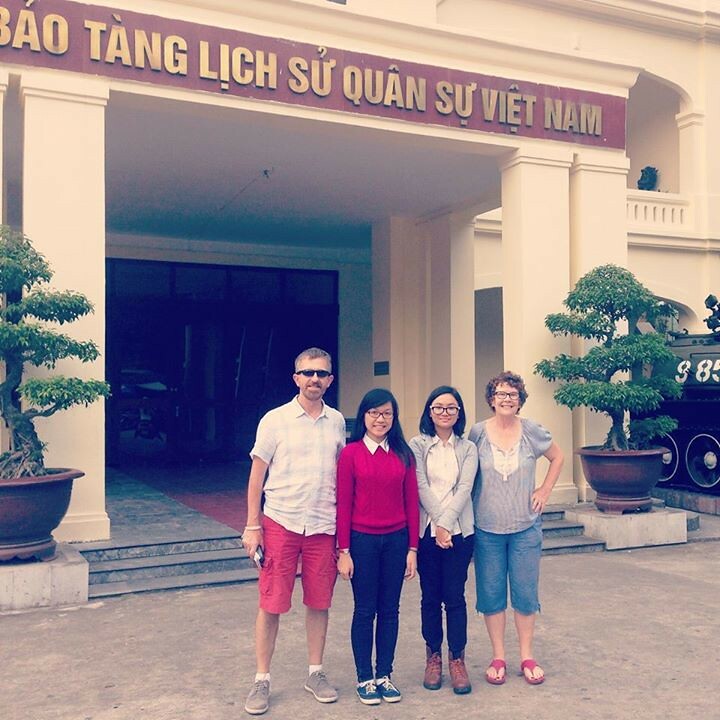 I parted ways with my guests not with Goodbyes, but with a “See you soon”, because I promised them that should they come back to Vietnam, I would surely guide them to the Museum of Ethnology, the place that we did narrow down to, albeit choosing the Military History Museum instead, and they also gave me their words to be my tour guide to anywhere in Dublin should I be there. My second and final trial tour ended there with a prominently promising sequel.